It was kind of chilly and overcast here yesterday, so I was definitely feeling the fall soup vibe. And with Hatch chile season upon us, I'm always looking for dishes to sneak them into. Although I live in Southern California now, I was born and raised mostly in Texas. Along with "southern-fried everything", Tex-Mex food is a staple where I'm from, so I'd like to share a Chicken Tortilla Soup recipe that I hope you'll enjoy. There are so many ways to make this soup, but I've found making the chicken in the slow cooker yields the most tender and juicy results. cooking away in the slow cooker aka "crock pot"
Place chicken, chicken stock, water, tomatoes, onion, garlic, chiles, juice of 2 limes, cumin, paprika, salt, and pepper to slow cooker set to low. Close lid and allow to cook for 6-8 hours until chicken is cooked through and no longer pink. When fully cooked, take chicken from slow cooker and remove bone and skin from chicken breast meat. Cut breast meat into bite-size pieces and return to slow cooker. 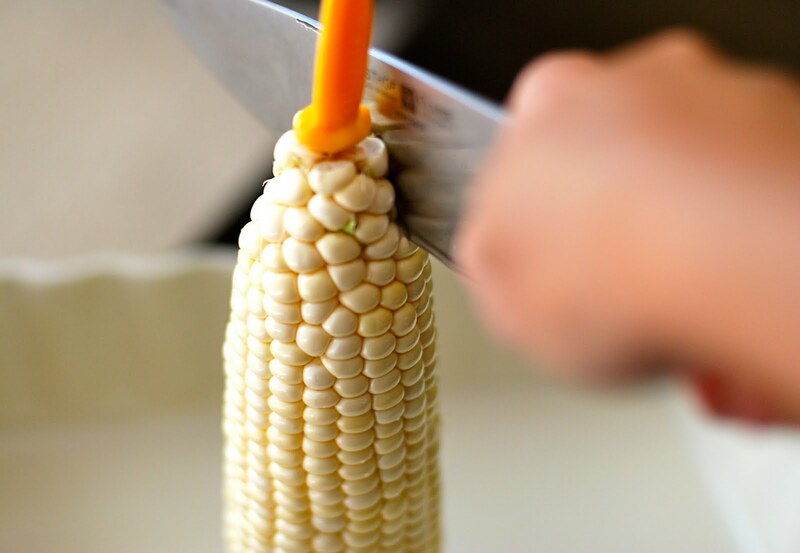 Cut raw corn from cobs and add to slow cooker. No need to cook any longer, the corn will be juicy and crunchy and warmed from the soup. Mix and taste for seasoning. Add additional salt or pepper if desired. Cut 1 lime into wedges. Spoon soup into bowls and top with avocado, fresh cilantro, dollop of cream, and tortilla chips. Serve with wedge of lime. Cook's note: You could use boneless, skinless chicken breasts but for this dish I really prefer the bone-in, skin-on breasts as it imparts so much more flavor. Agreed that the bone imparts so much flavor. Lovely soup. Some of my favorite flavor combos at work. Beautifully presented as well. I'd take this any day of the week. Let's try again! Where in Texas did you grow up? I grew up in the Houston area, but live in San Antonio now. I love tortilla soup, just waiting for the weather to turn cool b/c I make lots of soup when that eventually happens! Hi Wendy - born in Central Texas (Army brat), lived most of my adult life in the North Dallas area until moving to Southern CA. Love the San Antonio area. I know what you mean about the cool weather - soup's on! This looks so fresh and good. I've been looking for a good chicken tortilla soup recipe. Thanks! Very Refreshing... Nice shots. What camera do you use Veronica? Thanks Carolyn! I know you have some dietary preferences/restrictions so wanted you to know you could leave the skin off the chicken if that helps. I've done it both ways. I just prefer the extra bit of fat/flavor it provides, but definitely not a necessity. Hi there Gordon - thank you - I use a Nikon D80 with natural light whenever possible. I should have known a Texan would know how to make Tortilla soup! I love tortilla soup, yours looks delicious! I am from San Antonio, and have been living in New Jersey way too long! "Southern fried-everything"...isn't that the truth! This tortilla soup looks super yummy and perfect for the cooler temps. that is if it ever gets cooler! Thanks Kristie! You know how that weather in Texas is...just wait an hour and it'll change! this soup looks delicious:) you have such a beautiful blog...thanks for sharing this recipe. Thank you so much blackbook! I just went to your site and saw your Thai pineapple rice, OMG, I'm so hungry now!